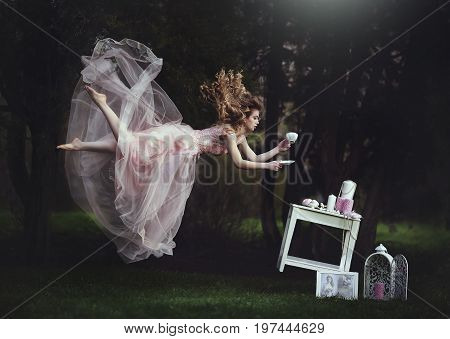 mug › Buy Poster of A beautiful blond girl is leaning with a mug of tea over a table. Lack of gravity. Like Alice in Wonderland. A girl with long hair flies like in a fairy tale. Poster of A beautiful blond girl is leaning with a mug of tea over a table. Lack of gravity. Like Alice in Wonderland. A girl with long hair flies like in a fairy tale.